Herman Bowersox’s secrets will die with him, or so he believes. In truth, the weight of his sins will fall upon his grandson, Henry, with a force he could never anticipate. As Henry unravels Herman’s unspeakable past, he will discover how brutally the “sins of the father” can impact the present. Those sins have metastasized in the form of The Ravens, a clandestine brotherhood committed to racial purity. Led by the cerebral and methodical Phillip Kaiser, The Ravens intend to re-start the Civil War using old-fashioned violence combined with 21st Century technology. In his journey to find the truth about his family’s past, Henry will meet Ty and Deja Lockwood, a brother and sister whose grandfather was murdered by Henry’s family. 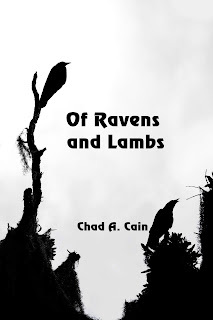 With their help, and with a deep-seated yearning to transform his family’s legacy, Henry will risk the lives of everyone he loves to thwart the plans of The Ravens. I've been a writer my entire life. It started with short stories in elementary school, then I wrote a novella in 8th grade that would have gotten me expelled if I were a student today! The point is, I've always enjoyed the experience of creating stories and characters. I now have two novels in print thanks to the good folks at Solstice Publishing. My first book, One Night In October, was released in April of 2015 to glowing reviews. It was a lifelong dream to see my name on the cover of a novel, and the experience was mostly what I had hoped it would be. My second novel, Of Ravens and Lambs, was released April 16th, 2018. It is a departure from my first novel, into the realm of suspense. I hope readers will find both books to be enjoyable and worth their time. I spend my days teaching history in Evansville, Indiana and doing PA announcing for our baseball and basketball teams. My beautiful wife Heather (pictured above) is my soul mate and traveling partner through this life. We have one cat, but no kids! If you've read One Night In October (or just perused the cover), you'll know I'm a lifelong Cardinals fan. I try to vary my interests between books, movies, TV shows, and, of course, writing. Some of my "go-to" authors are Greg Iles, Preston and Child, and C.S. Lewis. On TV, nothing beats The Americans and Fargo right now. I always enjoy hearing feedback about my work, so please feel free to contact me via Facebook, Twitter, or leave a comment on my blog. God bless!